Jail Breaks games or Escape Rooms games are getting popular these days. In these games you will be put in a room along with some of your friends. This room will be having few doors for your escape and you have to solve many different physical puzzles in the room to finally open one of these doors which will lead you to another room where a new set of mental challenges will be waiting for you. When you are in room you will be watched by through CCTV cameras and many times helpful hints will be given to you to help you to solve these brain teasers in the room. Now imagine that you are stuck in a room where there are three doors for escaping and you know what is behind each of these doors. You have to choose on these doors to escape from this room. Do remember that choosing wrong door may get you killed. However out of these three doors one will give you escape path. So you have think and study carefully what is behind this door and then make your choice. Answers of these puzzles is given at the end of this post. However try solving these puzzles without looking at these answers. So are you ready to play this Escape Room Mystery Puzzles? Lets start with the first room. 1. You are stuck in a big room and there are 3 doors in the room by which you can escape. 1st door has army of people carrying weapons behind it, which will kill you immediately on the first sight. 2nd door contains lions which are not fed in last couple of years. 3rd door leads to fall in the bottomless pit. Which room you will select to escape? 2. Now you got escape through one of the door in the previous brain teaser which leads to another room. This room is having one window from which light is coming but it is too far from your reach. Again there are three doors to choose from. 1st door contains the lens which magnifies sun rays so much that even opening the door will burn you completely. 2nd door contains acid which will burn someone immediately after door is opened. 3rd door there are wild animals which are alive and someone entering this room will become food of these wild animals, the moment door is opened. Which door you will choose to escape from this room. 1st door lead to terrorist's zone where one entering will immediately bombarded with thousands of bullets. 2nd doors leads to haunted valley where anyone coming will be tortured to death by the ghosts. 3rd door leads electrical bridge which will give you high voltage shocks which is enough to kill anyone who comes in this contact with this bridge. Which Door will you choose to finally escape? 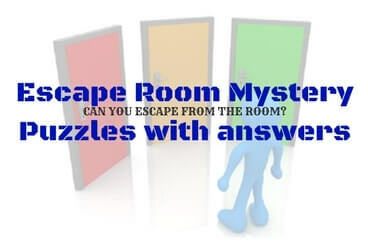 To solve escape room mystery puzzles, you require your logical reasoning and visual skills. To checkout below listed visual puzzles and logical reasoning puzzles to challenge your brain. Dead Wife Murder Crime Detective Mystery Puzzle : This is very interesting murder mystery puzzle. You have to play detective in the puzzle and solve the murder mystery. Lateral Thinking Puzzles for kids with answers: These are puzzles which will make you think out of box. Tough Picture Puzzles for Adults : These are the visual puzzles in which your challenge is to find the hidden animals in the given picture puzzle images. Reading Brain Teasers to Train your Brain: At last this is the reading challenge in which your challenge is to read the given text in your first attempt. Answers of these Escape Room Mystery Puzzles are given below. We have hidden the answers so that one does not read the answers by mistake or unknowingly. Do select the text between the answers to look at the answer of the corresponding escape room mystery puzzle. 1. 2nd Door. Because if the lions are not fed for couple of years, then these lions will be dead by this time. 2. 1st door at night because at night there will not be sun rays and window in the room will help me to know whether its day time or night time. 3. 3rd Door, It is because electricity is not there. So one can pass the electrical bright without any problems. Here is answer to 5th Brain Teaser Question of post titled "Out of Box Thinking Fun Brain Teasers with answers to Challenge your Mind ". 7. NOTHING is more important than your life. I swear I will give u NOTHING if u get d answer.